So the first thing that I need to say about these things is…YUM! But the second thing that I need to say about them is…it took me a really long time to come up with a name for them! Kind of an embarrassingly long time. I may have lost productivity at work because of it. 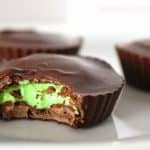 The thing is – they taste a lot like a peppermint patty, but the texture of the filling is like that of a Mallo Cup (along the lines of Marshmallow Fluff filling if you’re not familiar with Mallo Cups). 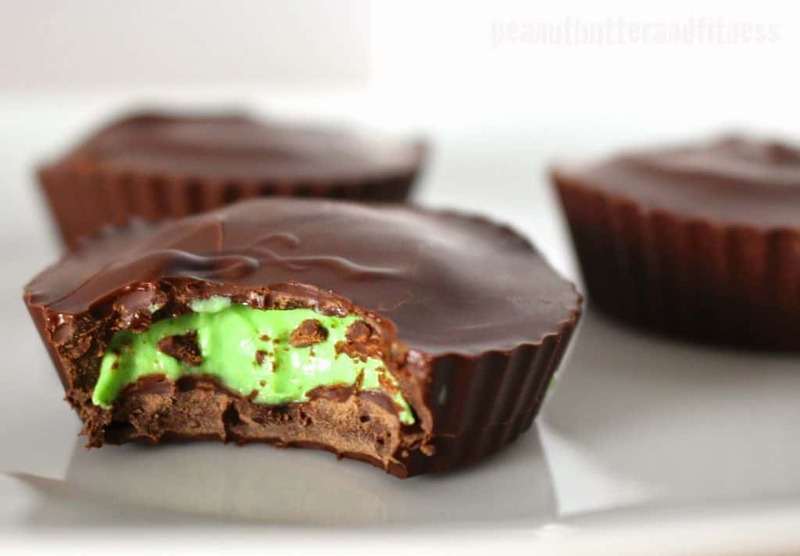 So anyways, I wanted to capture the fact that the filling is this awesome, minty, and St. Patty’s day worthy mix of healthy things surrounded by a dark chocolate shell. You get the idea. It was complicated. So I went with simple. Shamrock conveys the fact that they contain green minty stuff right? I hope so. It’s too late to rename. 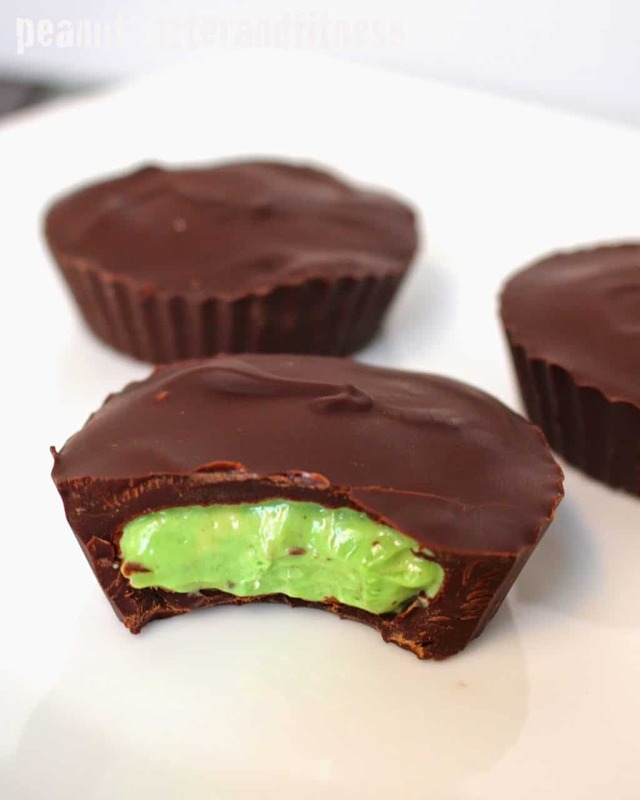 Anyways…I completely winged it when it came to the filling here. I said to myself “I need something green for St. Patty’s Day. And I want it to include Cellucor Mint Chocolate Chip whey protein because it’s about damn time I open up that sampler pack.” And then this just kind of happened. I thought maybe the texture would come out nasty on the first try but it was really freakin’ awesome. So I declared victory! And proceeded to stuff my face with it. Although I have to admit – I jacked up the melting of the chocolate chips. Which is why it looks lumpy in the picture above. It’s not supposed to be that way, so don’t try to get your chocolate base to look like mine. Make it nice and smooth. Melt approximately a third of the chocolate chips over medium-low heat. 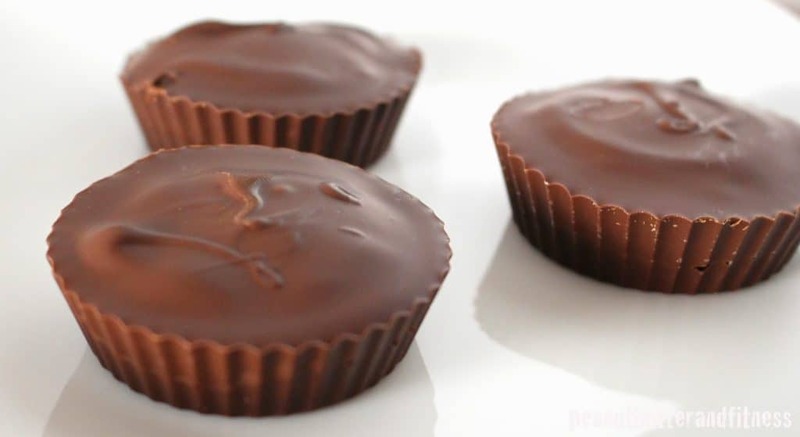 Spread in a thin layer among 10 silicone baking cups. Place on tray in the freezer to harden. 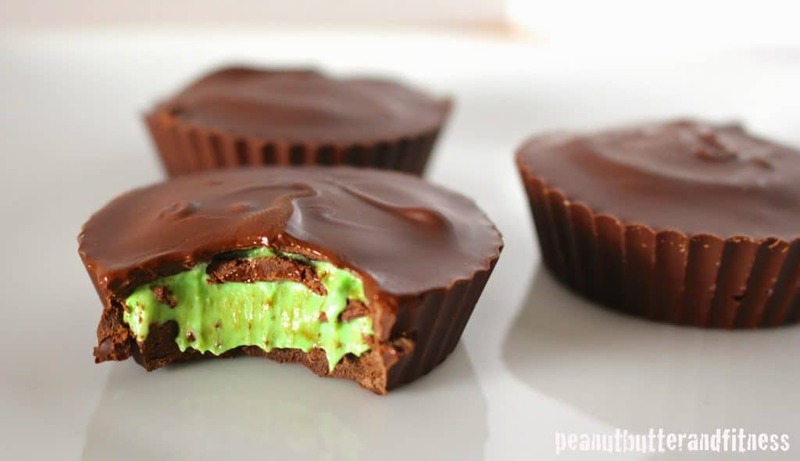 In a small bowl, mix Greek yogurt, protein powder, peppermint extract and food coloring until smooth. Set aside. Melt coconut oil in microwave for 15-20 seconds. Whisk in arrowroot flour until smooth. Add into yogurt mixture and mix. Spoon yogurt mix on top of frozen chocolate, leaving room on the sides of the silicone baking cups for more chocolate. Set aside in freezer. Melt remaining chocolate and spoon over yogurt, spreading to the sides to cover all of the yogurt mix. Store in refrigerator or freezer until serving. 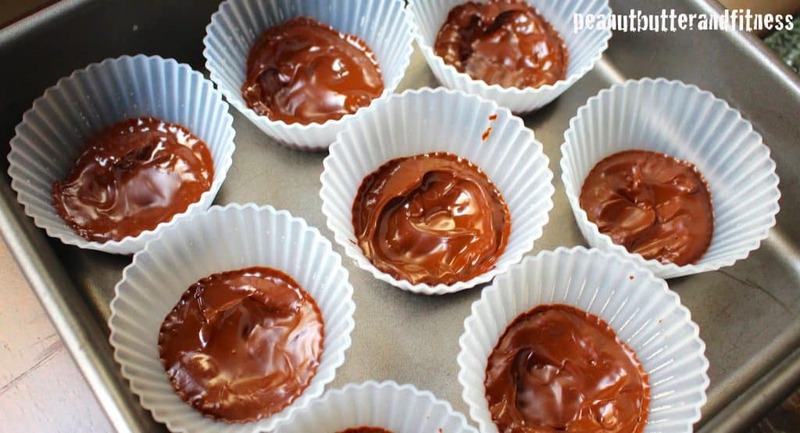 Melt approximately a third of the chocolate chips over medium-low heat. Spread in a thin layer among 10 silicone baking cups. Place on tray in the freezer to harden. 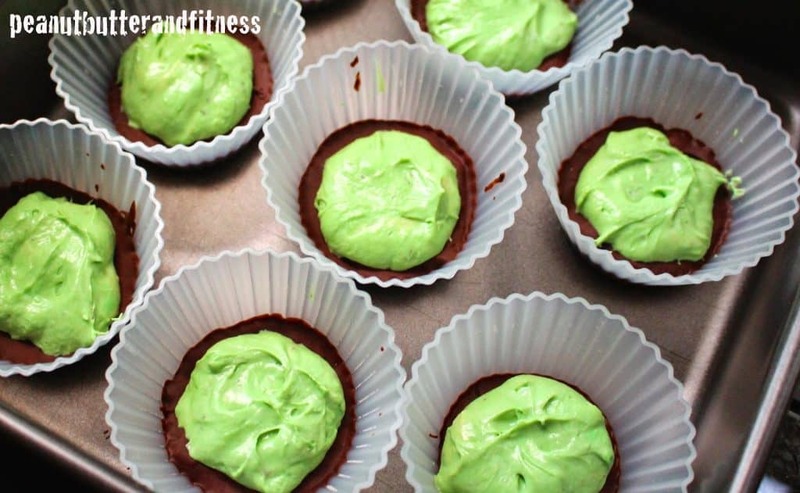 In a small bowl, mix Greek yogurt, protein powder, peppermint extract and food coloring until smooth. Set aside. 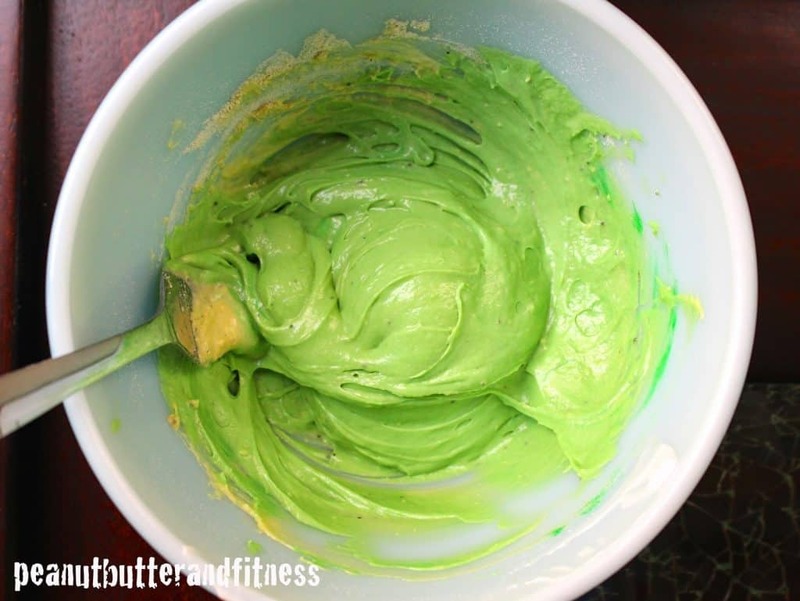 Melt coconut oil in microwave for 15-20 seconds. Whisk in arrowroot flour until smooth. Add into yogurt mixture and mix. Spoon yogurt mix on top of frozen chocolate, leaving room on the sides of the silicone baking cups for more chocolate. Set aside in freezer. Melt remaining chocolate and spoon over yogurt, spreading to the sides to cover all of the yogurt mix. Store in refrigerator or freezer until serving. 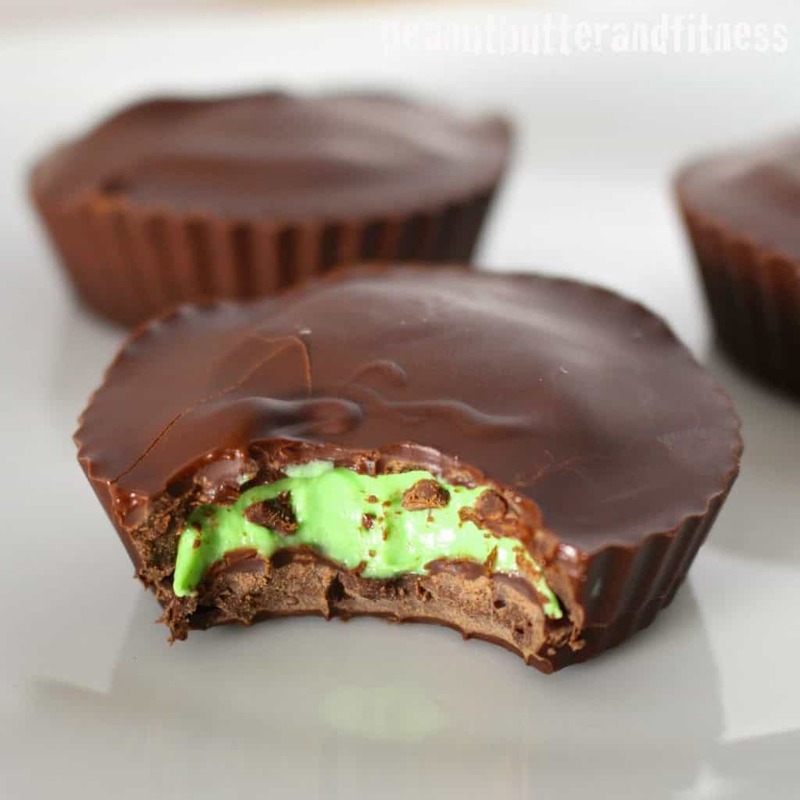 Peppermint & Chocolate together can do no wrong.. so I know these little protein cups would have tasted SO good. The colour of them is just incredible too!